A few days ago my office mate told me about the great debugging tool known as valgrind. Before I have been using the great pairing of emacs+gdb to debug segmentation faults and memory leaks... Now I would never use gdb for this. Moreover, I found a way to somewhat use it from within a shell in emacs to allow fast error browsing. Consider the following C code (where I have omitted the include statements), I'll assume it is in SegFault.c In fact, this code would not yield a segmentation fault as it is, at least without some compilation tweaking. And now execute this via valgrind. 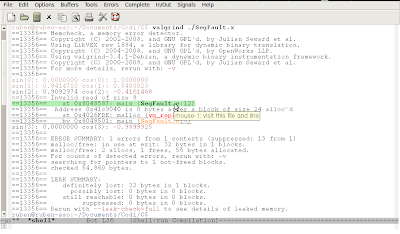 Valgrind acts as a virtual processor, thus keeping trace of memory accesses and the like, at a time penalty. You should use it only to find errors, not every time. ==24585== Memcheck, a memory error detector. ==24585== Copyright (C) 2002-2008, and GNU GPL'd, by Julian Seward et al. ==24585== Using LibVEX rev 1884, a library for dynamic binary translation. ==24585== Copyright (C) 2004-2008, and GNU GPL'd, by OpenWorks LLP. ==24585== Using valgrind-3.4.1-Debian, a dynamic binary instrumentation framework. ==24585== Copyright (C) 2000-2008, and GNU GPL'd, by Julian Seward et al. ==24585== malloc/free: in use at exit: 32 bytes in 1 blocks. ==24585== malloc/free: 2 allocs, 1 frees, 56 bytes allocated. ==24585== searching for pointers to 1 not-freed blocks. ==24585== definitely lost: 32 bytes in 1 blocks. ==24585== possibly lost: 0 bytes in 0 blocks. ==24585== still reachable: 0 bytes in 0 blocks. ==24585== suppressed: 0 bytes in 0 blocks. ==24585== Rerun with --leak-check=full to see details of leaked memory. Et voilà! Line number of exactly where memory access was out of bounds. What else could we ask for? Of course, emacs. Now when I start a shell window from within emacs, the function valgrind I defined is automatically loaded, starts compilation-minor-mode and redefines the return and shifted-return keys as I wanted. Now return works as usual in shell buffers, and shift-return visits error at point.I also made this function interactive (thus you can call it as M-x valgrind), in case I decide to remove the hook.